The Argentinian President said – even though it feels for many of us that progress is glacial and in some significant areas we are losing rights painstakingly gained – there can be no going back! This year I was fortunate to be invited to participate in the work of Women 20 (W20). W20 is one of the official engagement groups of G20, a global network in which representatives of the women in the G20 countries discuss and propose policies for economic empowerment of women to the governing bodies of G20 countries. This year the host country was Argentina. W20 delegations headed by Ms. Susana Balbo, Chair of 2018 W20 Argentina, delivered the policy recommendations to H.E. Mauricio Macri, President of Argentina for inclusion in the G20 agenda. 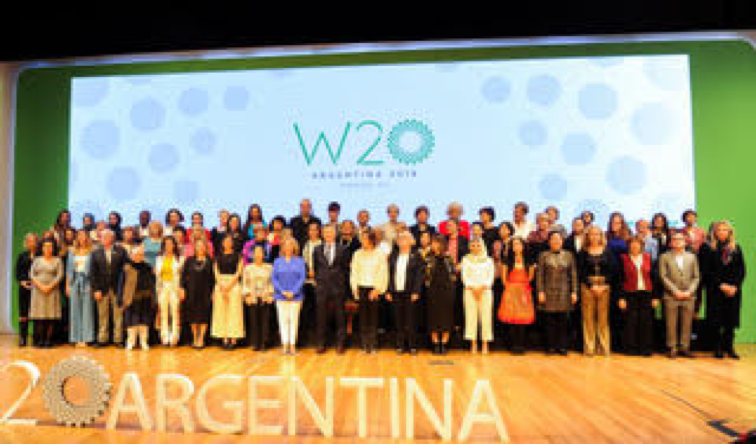 W20 summit meetings on the 2, 3, 4 October and to have a few days’ vacation to look around Buenos Aires. 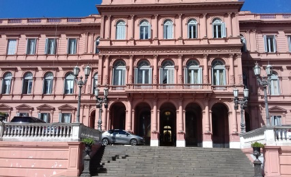 The reason I tell you this is because I was able to follow the journey of Eva Peron – the balcony Casa Rosada where she spoke to the people of Argentina and where she is buried in Recoleta. I also learnt that after the military took power her body was removed from Buenos Aires and reinterred in Milan, Italy from where it was eventually returned. The views about her legacy are mixed but clearly she is still held in high esteem amongst many. Whilst First Lady of Argentina she divided opinions. Flowers are left regularly but the memorial is not sign posted as others are. W20 was established in 2015 when G20 was hosted by Turkey. 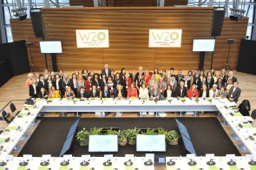 W20 is made up of women from CSOs, the business sector, entrepreneurs and think tanks. Its focus is the financial and economic development of the member states. W20 focuses on gender equality and women’s economic empowerment. The pillars of the W20s work include financial, digital and labour inclusion; with this year also a special focus on rural women. The culmination of a year’s work is to influence decision making groups in G20 and advocate for gender equality and inclusive policy making. The delegates are the driving force behind the W20. Argentina W20 focused on consolidating the achievements of earlier editions, taking a step forward in the attainment of its objectives. In order to achieve their inclusion in the labour market, women need to be given access to the development of digital and financial skills and so come closer to new opportunities. Needless to say all proposals must take into account a geographically-oriented perspective that understands that the context of rural women is different from that of urban women. In addition, steps need to be taken towards a cultural change to reduce the hurdles that keep women from becoming active agents in their development. mainstream the gender perspective into all G20 engagement groups. Delegates worked across the four focus topics and I joined the the Labour Group. Each group had a topic chair. We started work in February working remotely. The process included surveys, worshops, discussion forums and webinars. Our dialogue was maintined using an on line platform. The first step was the diagnosis of where we are now to inform the development of proposals of where we want to get to recognising that concensus must be acheived across the member states. Round table meetings were set up in June and July to produce the thematic communiques and the final overarching communique was agreed at the Summit meeting in October on the first day. The round tables are held in different countries – the Labour Roundtable was in Paris. I am not sure there is anything new in the communiques but I will leave you to decide. What matters for me is the important issues and challenges that have to be overcome to achieve gender equality remain visible on all agendas across the G20 countries. It is only by continuing to repeat our asks that they will one day be heard and acted upon. Where countries in the group take a lead they act as role models for other countries. As we all know peer pressure eventually prompts change. What we would all like to see is an acceleration of progress. The argument that having more women involved in the formal economy is better for societies has been made and yet here we find ourselves in 2018 still struggling to make it a reality. The evidence shows, for example, that by closing the gender gap in economic participation alone, global GDP would increase by 26%, that is, by 5.3 trillion dollars, by the year 2025. At the end of a very busy year we delivered 9 policy briefs, 4 topic-focused communiques, one final communique with recommendtaions to the world leaders and one menu of concrete actions to make the change we all desire real. W20 communique has a clear ask of the G20 to catalyse change. The communique has been circulated through the member states ‘Sherpas’ to their leadership. In the UK the delegates from Chatham House discussed the outcomes with the relevant Government Departments and actors prior to the G20 meeting. These briefings are undertaken in preparation for the G20 meeting held on 30 November and 1 December with the view to influencing member states to commit to the actions and individually and collectively make them a priority. You can read the communiques by clicking on the title. If you want to read the Concept notes which informed the communiques click here. If you are interested in the policy briefs click here. I was involved in the Laws and Regulations Impact Gender Equality – Opportunities for Advancement in G20 countries. I also worked on the development of the Labour concept note and the communique. In addition to the Communique G20 was also presented with a Menu of Actions. The Menu includes actions to implement the recommendations and existing best practice in the different member states including the UK. 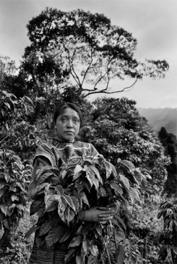 The Inter-American Institute for Cooperation on Agriculture (IICA), based in Costa Rica, sponsored a book titled “Warriors – Rural Women Around the World: 28 Enlightened Voices”, which has been published to commemorate the International Day of Rural Women, established by the UN. This publication celebrates the hosting of the G20 and W20 in South America for the first time and includes contributions and articles of 28 leaders in government, international organisations, academia, and media etc. around the world. If you are interested in finding out more about rural women click here to view the book. The W20 delegates, more than 60 women, came from different parts of the world to attend the workshops and public sessions. They shared a day of collaborative work and discussion about topics that, although not included in the final declaration, will be considered for the upcoming W20 summits. On the first day, a private meeting was held with 65 international delegates to prepare and sign the communiqué to be delivered to Argentina’s President, Mauricio Macri, including the recommendations for the G20 heads of states on the third day of the Summit. The first Lady, Juliana Awada, opened the sessions. We listened to the positions taken by organisations which worked together with W20 during 2018 and finalised the communique and recommendations for G20, reached by consensus. The greatest challenge about consensus in W20 relates to the diverse realities of women living in the G20 countries. From countries with advanced laws about gender equality, to countries that do not yet ensure basic women’s rights, the engagement group sets itself as an active-listening and open-dialogue network, where everyone agrees to ensure basic rights for all women. Here we really got to know each other and gelled as group. Working as a group has continued with What’s App and the on line platform which speaks volumes for the collective voice. The communiqué recommendations are based on the 4 focus topics: labour inclusion, digital inclusion, financial inclusion, and rural development. The latter was added by the chair of W20 Argentina, taking advantage of the possibility to provide opinion from the southern countries, which reflects in the final document through demands to the governments that, if adopted, will represent a significant change in the lives of rural women. G20 met on the 30 November and 1 December. You will recall it was a very busy couple of days with strained relations between America and Russia and the death of Jamal Khashoggi. It was debatable whether G20 would produce a declaration this year, but they did. The final declaration, which was based on concensus, has followed many of the W20 recommendations. You can read the document by clicking here. Point 12 is the most relevant which states gender equality is crucial for economic growth and fair and sustainable development.“ Leaders commit to reinforcing their effort towards the Brisbane 25×25 objective. Once again W20 was successful in influencing the international agenda and getting its recommendations included in the G20 final communique. However, as always there is still much work to do and we need to keep pushing and showing there is no way back on the acheivements of the inclusion of women. The words must be turned into actions. Last year we saw some progress as a result of the work of the W20 with the announcement at the G20 Leaders summit in July 2017 of the setting up of the We-Fi – US$1bn fund administered by the World Bank intended in part for women in conflict and post conflict countries to set up businesses (with a further US$3bn made available this year by the G7 member states to developing countries). What we need now is for the G20 member states to commit to W20 asks as outlined in the communique and crucially make more data readily available so progress can be measured. I hope you find something of interest to you and I will follow the G20 process and update you on any interesting developments.